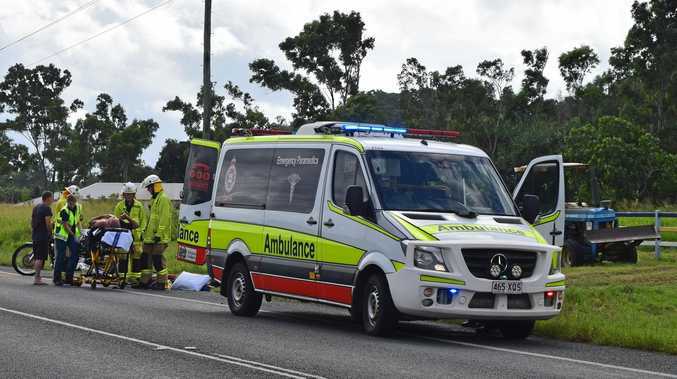 It's the cry of a devastated Gympie mother who yesterday had to rush to meet her 12-year-old daughter at the emergency department after a vicious school yard attack. The mother, who wishes to remain anonymous, said her daughter, a student at Gympie State High School was punched in the head up to 10 times by a student two years older than her that her daughter had never met. "She was actually heading back up to class when this girl came up behind her and said: 'Have you got a problem with me and do you want to fight? '," she said. When the girl refused to engage, she was punched in the head until she passed out, her mother said. She was taken by ambulance to hospital, where she was eventually released with a heavily bruised and swollen face, head, shoulder and arm. At home the girl told her mother: "Mummy I didn't even do anything." "She's physically sore and she's confused as to why somebody would want to do that to her," her mother said. "She loves her school, loves her school work - it's very sad - this is going to affect her for many months, maybe years to come." But the local mother refuses to blame the school, instead calling out parents who allow violent or disrespectful behaviour at home. "When is the community, and parents as a whole, going to stand up and stop this from happening? "We should not have to teach our children self defence to survive secondary school." A Department of Education spokesman said the incident "in which a student was injured during an argument" had been referred to police and the responsible student dealt with in line with the school's Responsible Behaviour Plan. "Any situation that threatens the safety and well-being of students or others in the school community is treated extremely seriously, and dealt with as a matter of priority," the spokesman said. "Gympie State High School does not tolerate bullying and violence and has implemented a range of pastoral care programs and initiatives across all year levels." "The school has also implemented a school-wide Positive Education program that explicitly teaches students expected behaviours (including anti-bullying). The mother said violence in schools was worsening. "At what point do we all say as a society: 'this is enough' and not let our children act like this anymore?"